You don't need to flood your lawn, just be sure to keep the turf and immediate underlying soil moist. You must be systemic, ensuring you water all areas. Keep in mind that during hot conditions, especially if it is windy, the lawn will dry out very quickly and additional watering may be required. Your lawn will let you know if it is drying out by its appearance and behaviour. The leaf blades will start to curl, shrivel and dry out so you'll know when it needs a drink. 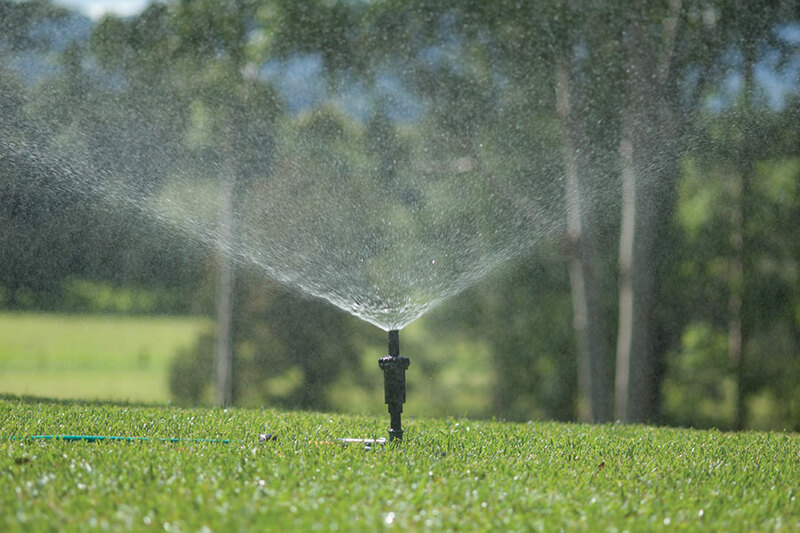 The best way to water is by overhead irrigation; in fact to establish a new lawn, overhead watering is the only way to go. Portable sprinklers attached to the end of a hose are cheap and efficient. Just move them around the lawn as required. A tap timer will ensure you don’t leave the water on for too long and waste water. An in-ground, pop-up irrigation system takes this a step further. This can be connected by a manual tap timer, or a computer controlled timer that is programmed to run as required. Hooking up a pop-up system to a rain water tank or using recycled water is the most environmentally friendly and cost effective method. Grey water is the wastewater from washing machines, laundry tubs, baths, showers and wash basins. It does NOT include wastewater from the toilet, dishwasher or kitchen sink, as these can contain unwanted solids and potentially nasties. Grey water can be used on the garden and lawn by bucket or water re-use system. This is a good way to recycle your grey water, reduce pressure on grey water waste systems, save on valuable drinking water reserves as well as save money. If you want to use grey water be sure to use environmentally friendly, sustainable detergents that won't harm your lawn. Before using grey water it is best to check with your local Council for advice as there may be regulations regarding the use of grey water in your area. Contact your local Council to see if underground water is available in your area. Once your lawn sets root into the soil, it is starting to become established. You can test for this by trying to gently lift a corner of a roll or slab; if it doesn't lift easily, the roots have set into the soil. This is a good thing as it means your lawn is growing well. Once establishment is happening you can start to back off the watering depending on the weather and the climate in your region. The idea is to get to a point where you water less frequently, but give the lawn a deep soaking when watering does occur. This encourages deep root systems and ultimately a more self -sufficient and drought tolerant lawn. As the water drains through the soil, the roots seek the water out deeper in the soil rather than just hanging around near the surface, which is what will happen if you just give short, regular waterings. Educate your lawn to go the distance. Drought tolerance one of the key characteristics of buffalo lawn, like Sir Walter. In many areas that receive fairly regular rain, you will almost never have to water a drought tolerant lawn at all, except during routine maintenance tasks like fertilising when you have to water the fertiliser in. During extended dry periods you may have to water your lawn more regularly to maintain a lush green look, but this is purely for cosmetic reasons.